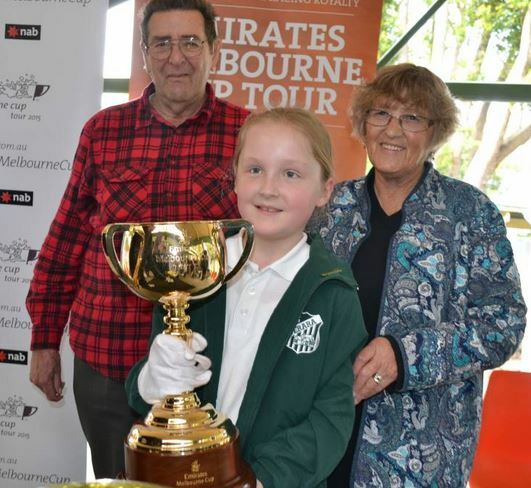 CUP: Maddy Jackson with her grandparents Dee and Dennis Matts at the 2015 Emirates Melbourne Cup visit to Terara Public. THE Shoalhaven’s Melbourne Cup tour jumped from the starting barrier and raced towards the finishing line on Friday. The tour of the golden cup started in the morning in Nowra’s Jelly Bean Park and people jockeyed for positions to get their photos taken with the $175 000 cup. Racing fans, school children and interested passer-bys all took the chance to have a photo take with the iconic trophy. Even the grandson of Etienne de Mestre, trainer of Archer who won the first Melbourne Cup in 1861, Mark de Mestre took the chance to have his photo taken with the cup. Mr de Mestre said seeing the cup gives him and many others pleasure and excitement.The cup tour included stops Osborne Nursing home, a school, a pre-school and the Shoalhaven Business awards.